January Freebie Digital Stamp "Bee Happy" and 2 Cute Ink Facebook Group Challenge! 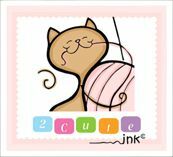 Make sure to grab your freebie digital stamp by being signed up for the 2 Cute Ink Newsletter! Remember you have from Jan 1- Jan 8th to sign up and you only need to sign up once and then you will always get a free digi on the 1st of every month it is that simple! :) This month's freebie is of a cute little bee, called "Bee Happy". We are having a special challenge in the 2 Cute Ink FB group where you can make anything crafty with this bee and enter to win more FREE digital stamps! So come on over and check out what everyone is creating and also check out the 2 cute ink DT made!